Enjoy an intimate time with swan boat ride as you circle around the lake with your special one. Slow down your time for tranquil moment of peace and serenity. Peddling gently across the sparkling Dasve Lake amidst the greenery and scenic beauty of Lavasa, away from the dust and grime of the city, the only sounds you would hear are softly chirping birds and soothing lake water splashing gently splashing under you boat. Available in 2 Seater Boat and 4 Seater Boat options.
. These boats are demanded by tours and adventure offering companies available across the country. To follow the global standards, experts construct all boats with the leadership of the personnel who have more knowledge of the related work. - Eco Puff Joint of Lower Part & Upper Part . Capitalizing on the ability of our skilled personnel, we are keenly instrumental in delivering a comprehensive array of Paddle Boat. 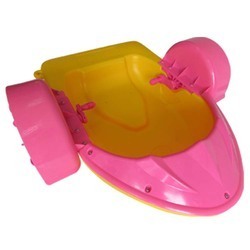 Our organization is engaged in manufacturing and supplying of Two Seater Pedal Boat- Duck Type. 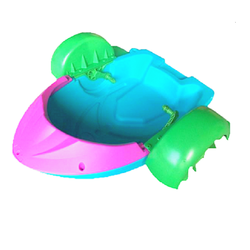 This boat is suitable for lakes and ponds. We use quality basic material in designing of this product. Our boats are available in various shapes and sizes to suit the varied needs of the customers. These products are resistant to bad climatesuch as interimittant rainfall and storm wind.